Macrophage. Coloured transmission electron micrograph (TEM) of a section through a macrophage that is absorbing a fat cell. The cytoplasm of the macrophage is blue, while the nucleus is the granular black area at the bottom of the cell. 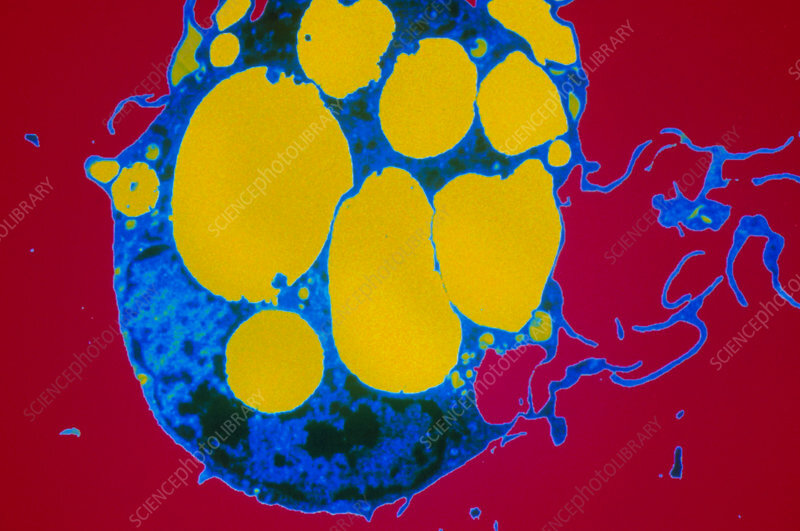 The yellow globules are the remains of the fragmented fat cell. To the right are pseudopodia (thin blue strands), temporary extensions of the macrophage marking the area where the fat cell was engulfed. Macrophages are leucocytes (white blood cells), part of the immune system that defends the body against antigens by digesting these foreign bodies. Magnification unknown.